Re-release of Bruce's best selling instrumental Holiday recording "Nature's Noel" (without nature sounds). Note: A version of this recording that included sounds from nature was previously released under the title "Nature's Noel". "Nature's Noel", originally released on the NorthSound Label, is now out of print. 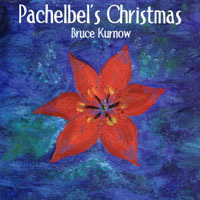 This is a wonderful CD that really puts you in the Christmas Spririt! I first heard this CD while at my reflexologist and I just had to have it!! So glad I found it online!! I liked the cd, but I had Nature's Noel on cassette and really enjoyed the nature sounds. Beautiful music. I miss the nature sounds from the Nature's Noel - I loved it! Please do a CD with the sounds of nature - I just loved that. I wore out the tape within a few months - I play it every day when I read my devotions. It's so lovely. I could listen to this CD all day! When I found Pachelbel's Christmas at CD Baby, I was estatic! I had Nature's Noel on cassette and the tape broke a year ago, so I searched all over to get another copy. I loved the nature sounds but Bruce's recordings are priceless with or without them!